A long-awaited opportunity now presents itself and I will be away from my computer for about seven days. The Cataract Canyon river trip, Utah’s whitest whitewater, beckons. While it is business-related, I plan on having an impressive amount of fun and being over-awed 92% of the time. See you in about a week. Deep in a cave underground, the absence of ambient light finds other ways into your psyche besides through your retinae. It presses its way through your eardrums, osmoses through tiny skin pores, and even tastes dark. So, also, is it with the absence of sound out here in the desert. Our acoustical environment is unique, and powerful, and (if you’ve been reading me for any length of time, you know this) a balm for my soul and spirit. It is also unsettling to those who have lived their lives with noise. Desert silence is an auditory black hole that often disorients a person. Does Shafer Canyon look quiet? Only a few decibels of noise are heard here. A soft whisper is 15 dB. In our regular lives sound is all around us, filling us at a low level continuously, irregularly punctuated with loud or louder. Car engines, iPods, wind, refrigerator hum, TV, crickets, leaves rustling, dog barking — our soundscape is comforting and familiar. If you picture this as colors and brushstrokes on an artist’s canvas, the few small bits of negative space are the quiet in our lives. Mercilessly, unapologetically, the desert presents a massive unblemished canvas of silent ‘negative sound-space.’ It is, as nearly as I can describe, almost a presence. Sitting on a high rock, straining to hear a single thing, the blanket of soundlessness pressing onto eardrums (retinae, skin pores, sinuses) threatens to undo all you’ve ever known about acoustics. The canvas is not just blank; it is utterly blank. Onto that surface may come a pinprick of sound-color: a one-syllable bird chirp from 800 feet below. Silence is the reality… sound is an intrusion. It takes some getting used to. Once this new reality becomes the norm, however, one is ruined — for good. Extrinsic noise now grates on me more than ever, somewhere on the continuum between irritating and malevolent. What am I supposed to learn from this? I’m trying to hike all the trails in our park before winter, so I can knowledgeably direct visitors to paths suitable for their abilities. Monday was the final day of Indian summer before our weather took an abrupt turn, and I was in the mood for a trek. 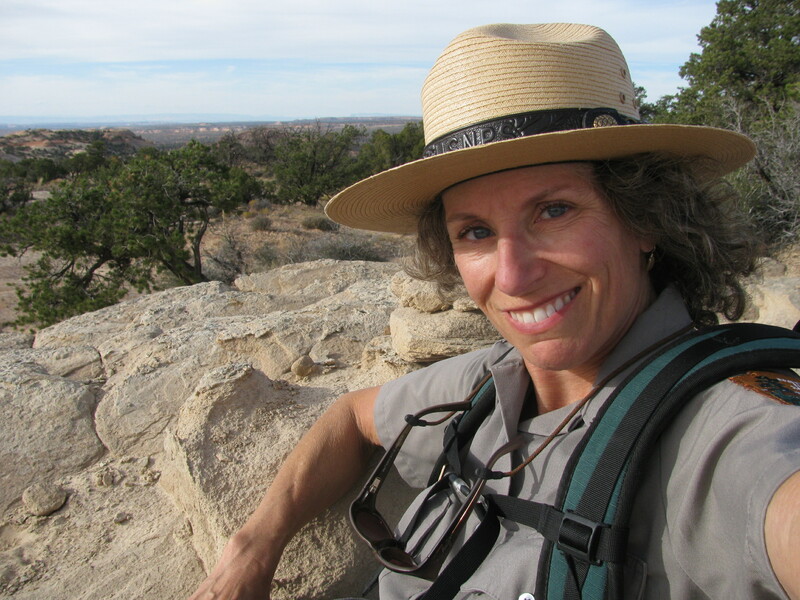 The Neck Spring trail is 5.8 miles of up and down through pinyon-juniper forest, grasslands, and rock outcroppings — a perfect fall hike on my afternoon rove shift, with my best boots and favorite flat hat. At mile 2, noticing abundant color, I began to shift my gaze to search for as many hues as I could possibly find. My mind drifted back to 18 months ago when one of my daughters shared a book with me exploring colors of the desert, and the idea was hatched for this gallery. Enjoy the sights! Due to painfully slow internet speeds up here on the mesa, multiple photos won’t load. Being resourceful, I’ve gone to Plan B and created a Facebook album which can be accessed by this link. More photos than I could ever tack on! My name's Ranger Kathryn and I believe every literate person should read the classics. Ah, the siren song of Google! The tantalizing allure of access to anything — literally anything — about which we want to read. The promise of more knowledge, more facts and opinions, more photos, and endless links. How can the classics compete with it? What young person would patiently work their way through 700+ pages of The Brothers Karamazov — which took Dostoyevsky nearly two years to write — when one can breeze through a Wikipedia article about it which took perhaps a day to write? Oh, sorry. I’m listening to my favorite Wagner overture — Tannhäuser — and its lofty, chromatic, brooding tone always inspires me to ponder Grand Themes. Here’s what I have to say: leave my blog and go pick up a classic. Today. Be enlarged. Sometimes it’s the small things that touch your heart. A humble toaster, perhaps. National Park Service accommodations are quite adequate, but kitchen provisions famously bare. My two housemates are moving out imminently as their seasons have ended, taking all their pots and pans and dishes and utensils with them. I, expecting to be finished by now also, didn’t bring kitchen stuff with me. Oh, I have my camping box; that’ll do for a couple of weeks before my furlough. But English muffins need to be toasted, you know? Neighbor Jackie departs today, and yesterday was giving away all her extra food. 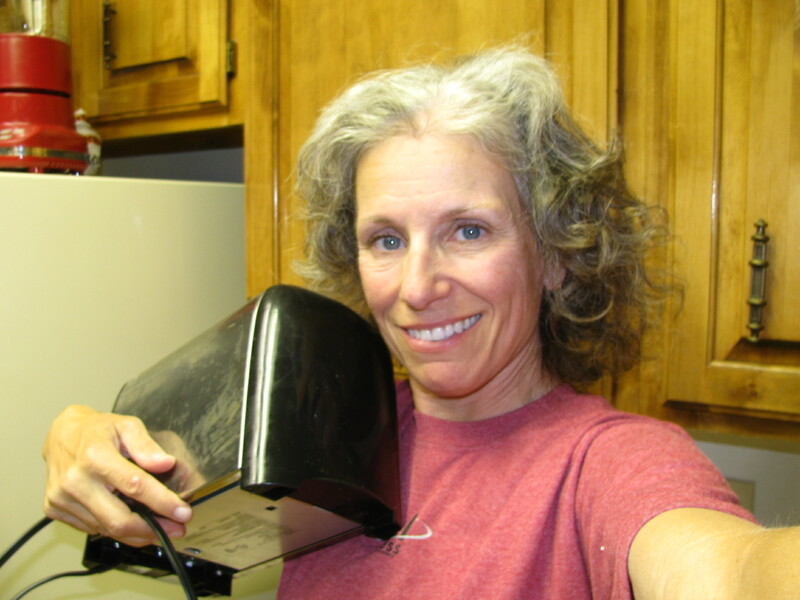 Without knowing of my lack, she handed me her toaster and said, “It’s yours. Use it well.” That stoic corner of my heart that had resigned itself to cold pale English muffins breathed a sigh of relief, and its tough edges softened. What a sweet, simple act. I will surely pay it forward when it’s my turn to leave. Leave a comment: What small item, or act of kindness, made an impact when it was bestowed on you? The 40,000th view of my blog happened yesterday afternoon. Somebody, somewhere, perhaps one of you reading this, was sipping on a cuppa joe and clicked on “Ranger Kathryn’s Arches;” the ticker moved to 40K. I look at my early posts from 2009 and shake my head. Somewhere in the past two years I have found my voice and lost much of my tentativeness. I don’t compose multiple drafts and agonize over each word choice. I just write. Mainly, I spend hours at my laptop to preserve memories and to share life with my family, friends, and strangers. It’s an outlet for my enthusiasm and passion and wonder. 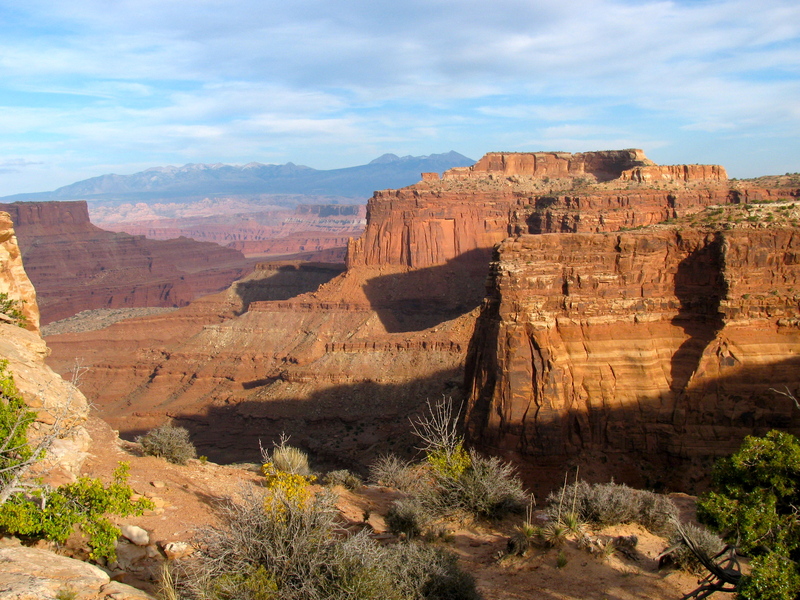 It gives me a forum for sharing the landscape of the Colorado Plateau in all its exquisiteness. It motivates me to pay attention to details. It lets me picture my readers, which is important in isolated wilderness places. It helps me practice writing. I think of odd things like: what if I have grandchildren some day, and I die before they get to know me? Would my blog be a gift to them? Blogging helps me be transparent, which is something I deeply believe in. 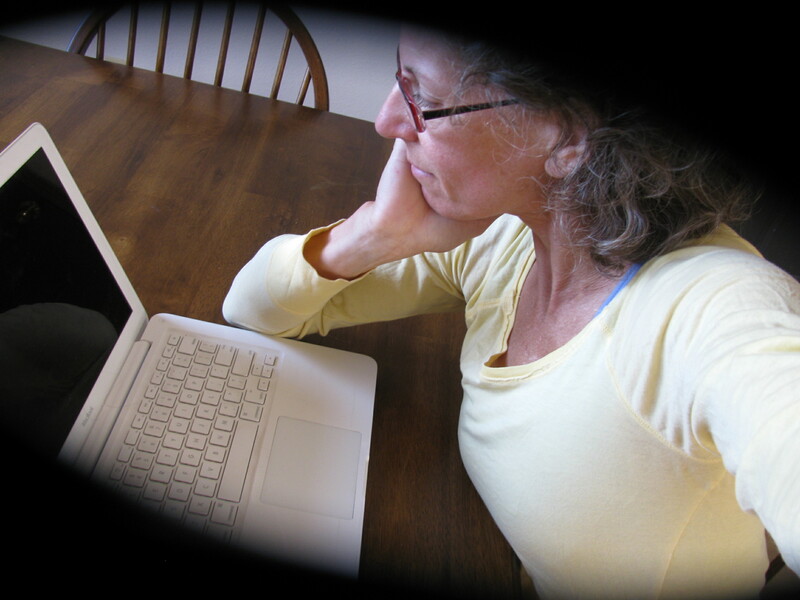 My readers can see my heart, or at least what I reveal of it. I wonder if my motives are selfish, that I’m seeking affirmation or admiration. How shallow. 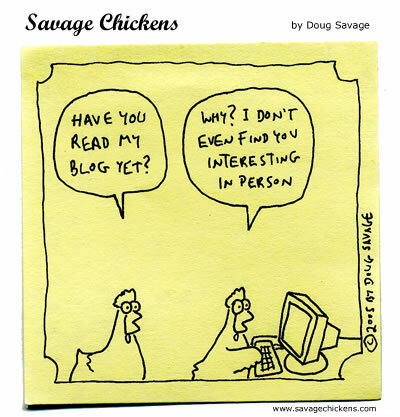 I blog so I know what I think. I’m an external processor, and often I have to hear or see words in order to make sense of my world. Understanding comes with the process of ordering my thoughts into phrases, sentences, paragraphs. With blogging, my thoughts (fears, dreams, etc) are shared and I can receive affirmation that I’m not alone in any of them. Blogging beats dating sites, hands down. Knowing that I have an audience pushes me to be more disciplined and regular. Thanks so much for your interest, curiosity, comments, and questions. I am richer for having each of you along. Here’s to the next 40,000 views! 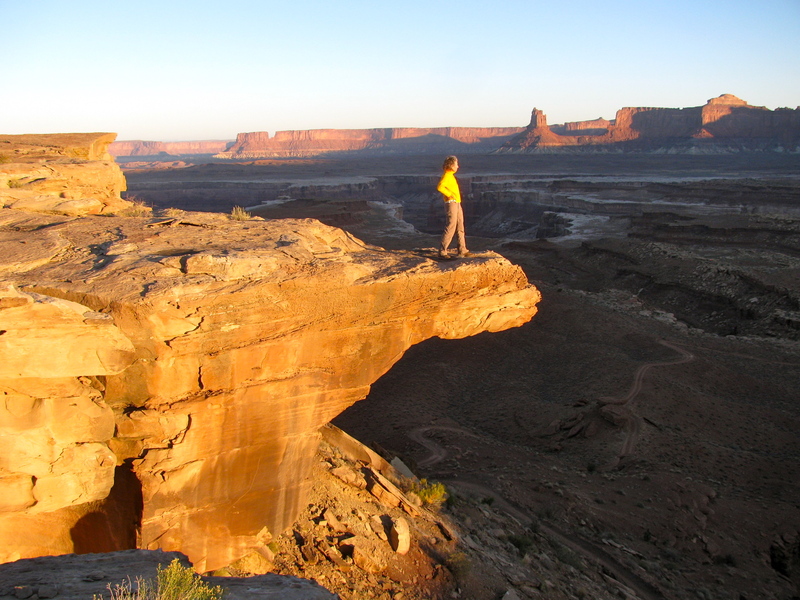 Visitor reactions to the spectacular views in Canyonlands National Park keep me grounded. They remind me of what wilderness does to a person. Many comments are purely visceral, as the individual often lacks words to describe what is happening within them. Those are my favorites: the unfiltered, ineloquent, deepest-gut-level responses to seeing a landscape that is so Other. Atop the switchbacks, looking at the 1300-foot descent and the canyons ahead. I had spent a sweaty hour trudging up the Murphy switchbacks. When I arrived on top, a man standing there greeted me and introduced himself as a visitor from Switzerland. He was staring down at the view in the photograph and kept repeating two words: “Just… wow.” Despite his excellent command of English, the immensity of the expanse momentarily robbed him of articulate speech. Over the next half hour I heard him tell of his stressful work as an architect, and how in his country efficiency and productivity and hard work are valued but things of the heart are not prioritized. People tend toward robotic rather than passionate. Stepping into the wilderness of the American West, he’s begun connecting with that long-ignored side of himself, and he hardly knows what to do with the emotions being stirred. Walking the remaining mile to the trailhead, I chewed on what I already knew: syllables aren’t necessary for truth to be communicated to our innermost beings. Words may be stumbling blocks. Wilderness speaks, just by our being in it. As I lay in my down bag a few yards from the canyon edge, the full moon chased away sleep. 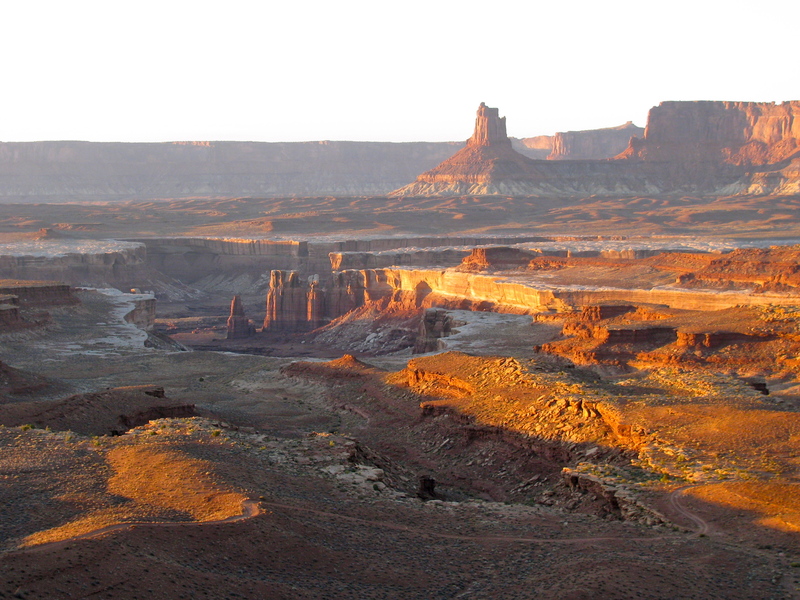 Its calm light bathed every nook of the White Rim as far as the eye could see, highlighting the light sandstone layer several hundred feet below. Intricate pinnacles and eroded pillars stood down there, every surface shimmering in the blue-black October night. Shooting stars swept in fast arcs across heaven. Jupiter was rising in tandem with the moon, only a hand-width away. And I was there, my soul soaking up light and life. It was my weekend. I had thrown my gear* into a backpack and grabbed my trekking poles to commence the ten-mile Murphy Loop from the mesa top: five miles down in the afternoon, meet friends camping at the trail bottom, hike out in the morning. I tried not to think about the switchbacks that would enable the 1300-foot elevation change. 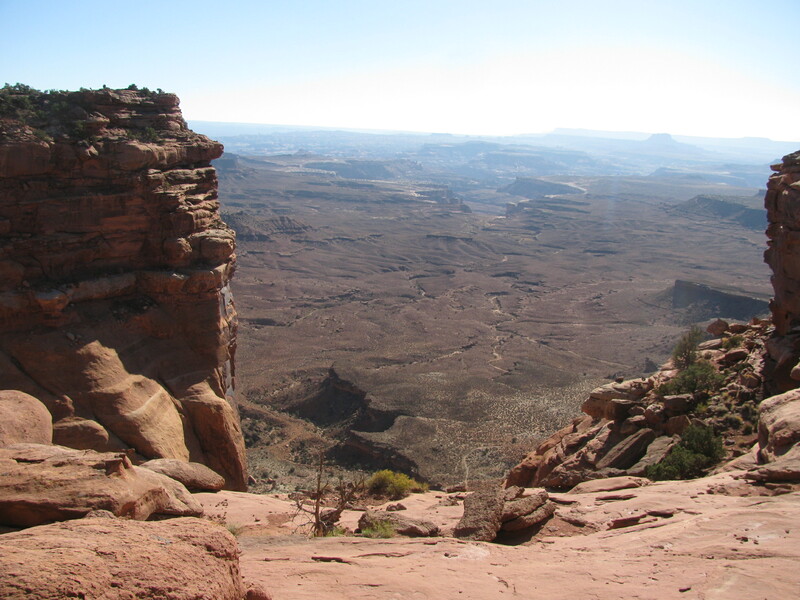 I am at a loss to find adjectives to describe the vastness, the immensity, the agoraphobic distances, the layers upon layers of texture and color that define Canyonlands National Park. As I stood on the mesa top ready to drop down through the Wingate sandstone, deep breaths of clear air replenished parts of me that were thirsty and hungry for backcountry — away from footprints and the people who make them. Only three humans crossed my path on my ten-mile trek. Folks, that’s a mighty fine day. *Gear list: sleeping bag and pad and small pillow; fleece vest and pullover and warm knitted hat; one gallon water; two peanut-butter bagels, a banana, an apple, and energy bars; camera; headlamp; topographic map, GPS, whistle; toothbrush and paste; contact lens stuff; toilet paper and small disposal bags. I consider myself a fairly fearless person. There’s not a lot that rattles me, and I’m always willing to try new things. That process of “trying and liking” is how I ended up entering the world of rock climbing, solo hiking, canyoneering, white-water rafting, etc. However, a co-worker ushered me into a new realm the other day that exposed some pretty deep fears. 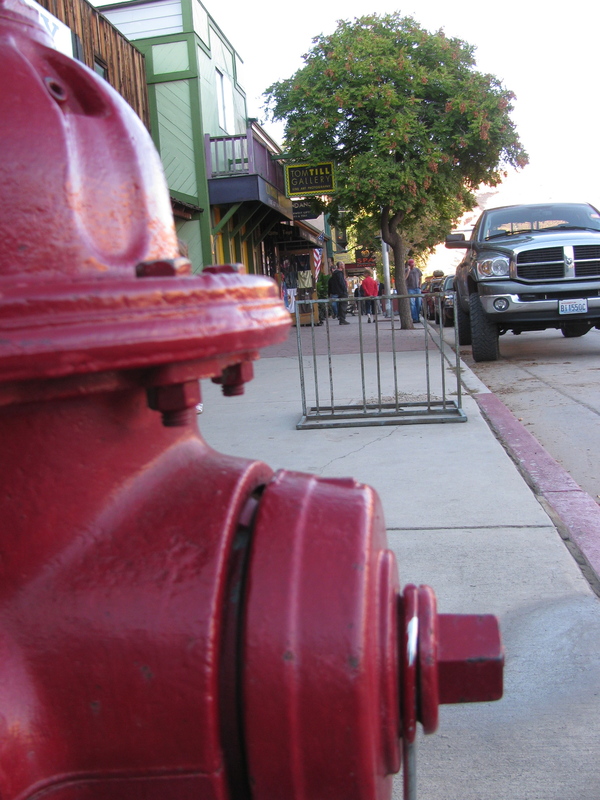 First I tried hiding behind a hydrant. Less than successful. He took me to Moab to practice street photography. Nathaniel and I rolled into town with our cameras a couple hours before sunset, and committed ourselves to trying to capture images of ordinary people interacting with their world. That’s all. Just cruise the busy artery of Main Street looking for interesting human scenarios to photograph. It’s harder than it sounds. I don’t want to offend people by snapping surreptitiously, but I also don’t want to create contrived photos by asking permission. Nathaniel taught me several techniques to decrease the wariness of my subjects, but I’m far too transparent and they all knew I was trying to sneak photos of them. It was awkward at times and I’m sure I looked sheepish. I got glared at once or twice, but my “Minnesota nice” middle-aged wouldn’t-hurt-a-fly persona must have been pretty non-threatening. Nobody called the police. 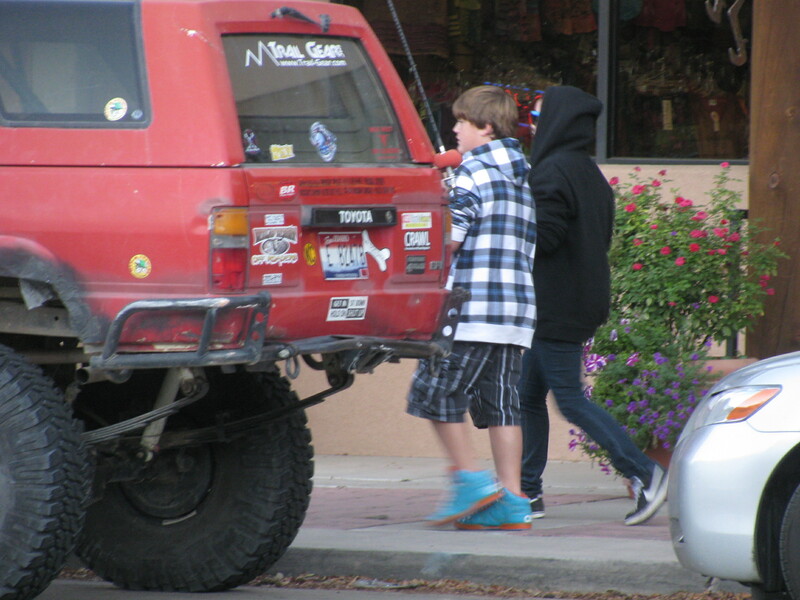 Then I found a tourist across the street, in turquoise shoes. Easy to shoot with zoom. While I enjoy people-watching better than people-photographing, I may try this again at some “event” that brings plentiful opportunities. To get good at it you really must shoot thousands of images. This day I felt wildly unsuccessful. Have you ever tried to photograph others without their knowledge? 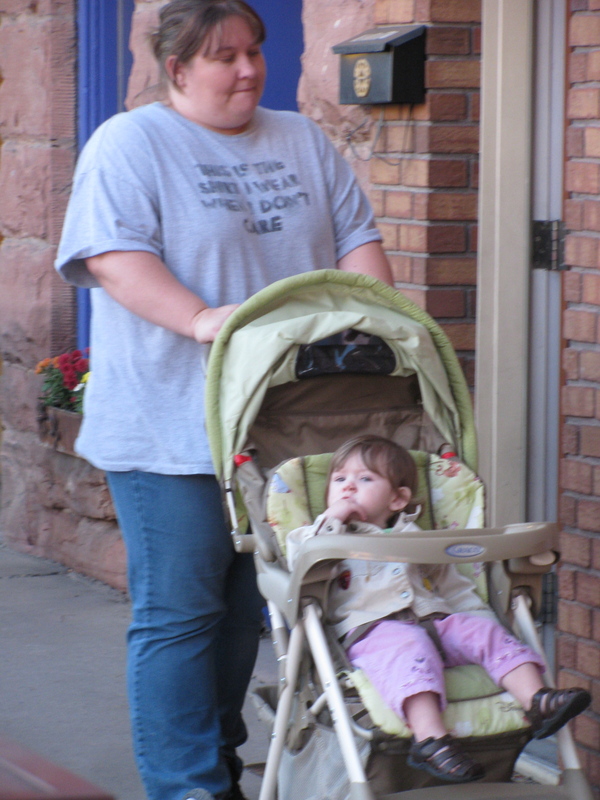 Shirt says: "This is the shirt I wear when I don't care." I needed more chances with her but she was on to me.